This seventh entry in Valerie Bowman’s “Playful Brides” series is supposedly based on The Scarlet Pimpernel. The hero is Cade Cavendish, twin of Rafe Cavendish from Book 4, The Irresistible Rogue, previously reviewed here. THE PLOT: Cade has always been the black sheep of the family. For a while, his twin believed he was dead. Now Cade is back in London, staying with Rafe and his wife, Daphne, and involved in some scheme. Rafe is afraid that his brother is up to no good, but is he really? Danielle LaCrosse is half-English, half-French, and all out for revenge. As a spy, she’s perfectly placed as Daphne’s maid in the Cavendish household. She catches Cade’s attention, though, and sparks fly. There’s danger for everyone along with some twin mix-ups. And who really is the mysterious Black Fox? TWO CENTS: I really enjoyed the first “Playful Brides” books, and I think my favorite entries in the series are the ones that play more heavily off their source material. I didn’t like Book 6 as much as much, and its connection to Pygmalion was really thin. I’m not terribly fond of this new book, either, and I feel like its basis in The Scarlet Pimpernel is limited to having a mysterious character with a color for a name. It doesn’t help that Pimpernel is one of my favorite stories, so I was really excited about this book, and feel pretty let down by its lack of similarity to Pimpernel. Not that I expect these books to be the same as their sources, but look at my favorite in the series, Book 3, The Unlikely Lady (previously reviewed here). There were just enough elements of Much Ado About Nothing to make the connection clear. If the ad copy hadn’t said Never Trust a Pirate was based on Pimpernel, I’d never know it. For me, the biggest problem with this book isn’t necessarily with the couple, but with the very light treatment of them as spies. If you’re used to reading, say, Joanna Bourne’s “Spymaster” series, you’ll be a little underwhelmed by the technique and seriousness of these spies. 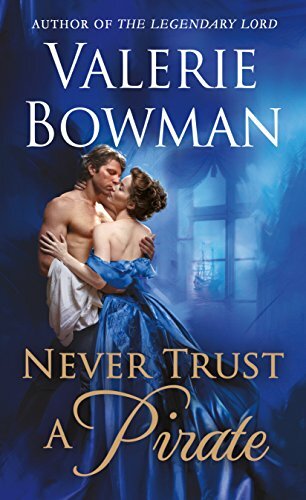 If Joanna Bourne is too dark for you, and you’re more interested in lighter romance, you may really enjoy this book. Despite its lightness, part of me felt that I never quite caught up with what was happening in this story, and I think it’s because the waters are deliberately muddied so the reader doesn’t really understand what’s going on. I get that there’s supposed to be a big surprise reveal, and you’re not really supposed to know who is sharking who until the last minute, but that part just didn’t build for me. Also, I feel like the huge reveal was built on a cheat, so at the end I was all like, “Wait a minute…but didn’t it say…” I get it, the author wanted the reader to be surprised. But I was just mostly confused. Maybe it’s just me? COVER NOTES: The cover in and of itself is very attractive. Its look is similar to the new tone set by Book 6, The Legendary Lord. One color scheme, couple in an embrace. The deep blue is very pleasing. However, I AM going to call the publisher, St. Martin’s, out on one thing: this book essentially shares a cover with two other books! If you want to see what I mean, check out the covers for Amelia Grey’s Last Night with the Duke and Kerrigan Byrne’s forthcoming The Scot Beds His Wife. All three have the same blue shade, the same font for author name, the same font for book title, clinch couples, and even similar backgrounds on Pirate and Scot. Back in the day, I knew of people who didn’t necessarily recognize authors or book titles; they just picked up romances based on their covers. If these sort of customers still exist, I can see them passing over two of the other books after buying one, believing they’re all the same book. This would just seem to be a business mistake. Make these books stand out from one another! BOTTOM LINE: Again, I would not recommend this as an intro to Valerie Bowman, or to the “Playful Brides” series. Yes, it can stand on its own as a story, but a lot of the earlier entries are much stronger, in my opinion. Read it if you’re already in the series, but otherwise, start with Book 1. ON SALE DATE: Available May 2, 2017, in paperback and eformats. NEXT UP IN THE SERIES: Book 8, The Right Kind of Rogue, will release October 31, 2017, and feature Hart and Meg, who we met in The Legendary Lord, and will be based (somewhat?) on Romeo and Juliet. It’s a romance, so I very much doubt the couple will die. THE PLOT: Rosamund and her husband Rob are finally enjoying some happy marital time when Rosamund gets word that her stepfather has died. Although she had never reconciled with her mother or stepfather after eloping with Rob, Rosamund sets off for Cornwall to pay her respects. Her mother, who is both wacky and wildly unpleasant, claims that her husband was actually murdered, not just killed in a horseback-riding accident. Rosamund doesn’t believe it at first, but a few of Walsingham’s agents are flitting around, and pirates are mentioned. Then a second murder takes place, and Rosamund is on the case. Is piracy the problem, or are pirates actually working for the Crown? Is there a Catholic uprising in the works? And why do Rosamund and Rob keep getting pulled back into Walsingham’s spy network despite a desperate desire to get out? I was a little confused by all the characters, which makes it difficult to try to figure out who the murderer is. I don’t know why I had a hard time in this book; I haven’t had difficulty following the other two mysteries. But every time I picked it back up, I had to think, “Now wait, WHO is this guy again?” I also felt that the ending was rushed. Suddenly, it was just over with very little wrap-up. Maybe it will lead directly into Book 4? COVER NOTES: This cover is totally different from the headless woman covers of the first two books. 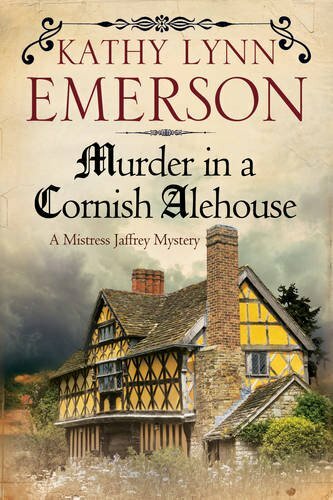 I usually hate it when series covers go a completely different direction midstream, but I really like the Cornish alehouse! Maybe the headless woman covers tended to make readers think these books were more romantic historical fiction, so this is an attempt to break that perception. BOTTOM LINE: A must-read if you’re following the series as Rosamund and Rob are continuing to develop. But I wouldn’t recommend reading it before the other two in the series, or as a stand-alone. Start with Book 1, Murder in the Queen’s Wardrobe.